How to raise more money using tested techniques. Grab a pen, open up the workbook, and start taking notes … fast! This is advanced education in silent auctions. This webinar had been recommended by another Developer who had found it useful. After our 1st silent auction last year, this gives me good ammunition to aim much, much higher at this year’s gala. 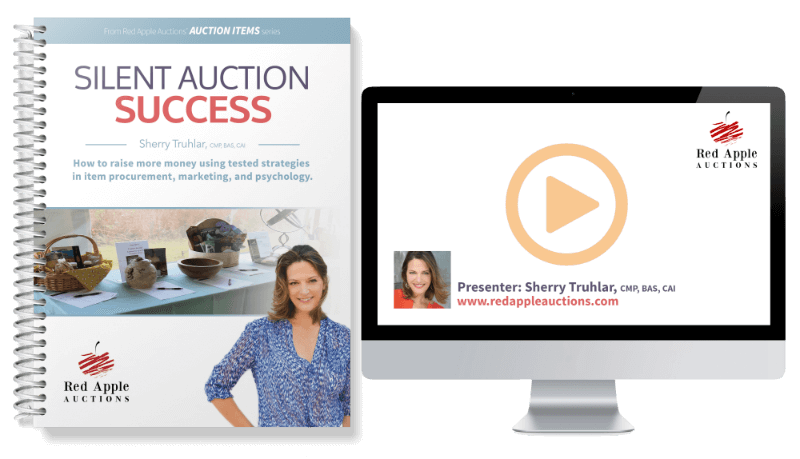 In this webinar, you’ll learn the tricks — the marketing, the psychology, and the science — behind a top-performing silent auction. 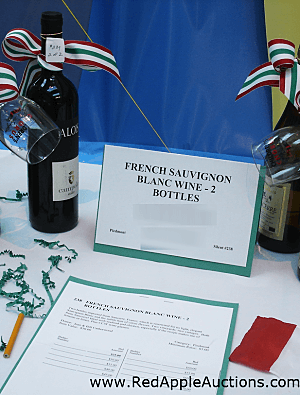 How do you get people to PAY ATTENTION to the silent auction? How do you make the guests BID? These are common questions from auction organizers. The good news is that there are ways to do this, and you’ll see the improvements in your revenue once you start implementing these concepts. I hung up the phone anxious to start working on/organizing a plan for my organization’s auction being held in October. Got auction software? You’ll learn how to use EXISTING DATA to re-design and improve your auction THIS year. (This was the big “AHA!” with one nonprofit when I presented this concept in Texas.) Going one step further, take your results from your real silent auction and use it in the templates (located on a private webpage) so you can see how your auction can be changed to raise more money. Real-life examples of how nonprofits are adopting marketing ideas from corporations (DSW Shoe Warehouse, Nordstrom, Target, Kmart) to improve sales. Ever heard of sign-ups? A common flaw to selling these activities is that nonprofits often price the party too high or too low. Guests either won’t buy or buy too quickly. You’ll learn a new strategy to fix this annoying problem, so your party is perfectly priced. Incorporating mobile bidding? If you’re considering adopting this technology, learn the right questions to ask your vendors so you get the best technology to meet your needs for you AND your guests. How to transition bids from an online auction into the silent auction to involve more people in the bidding process. Many, many tricks and simple tips that have been proven to improve revenues .. sometimes by over 20%! 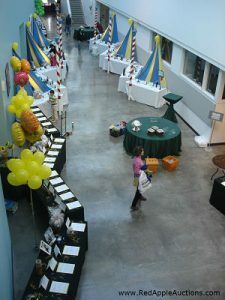 If you want to have an “easy silent auction,” this is THE PREFERRED training to hand over to your silent auction team. Ask them to watch it every year, a few weeks before your event, as a reminder of what to do. Bonus (download online): Bid sheets in Excel format that will automatically configure all of your pre-printed increments and Guaranteed Bid (if you want to use it). Save this, print it out (or send it to your printer), and your bid sheets are DONE! For my clients that haven’t yet invested in auction software, this is how they produce bid sheets for their auction. Choose from among half-sized bid sheets and full-sized bid sheets. I have chaired a non-profit annual fundraising dinner for the past six years. Our attendance has grown from 350 when I started to 800 this past year. The Silent Auction has become a significant part of the fundraising for the evening. This webinar was excellent and will give me a much better idea on how to improve it this year as well as the types of items that are the best sellers! I love the spreadsheet and will use that to determine our best ROI. You are running a silent auction for the first time. You can’t afford silent auction software, and want a way to easily produce silent auction bid sheets. You are a ‘pro’ at silent auctions and have seen a lot, but are stumped at how to get guests to pay more attention to your fabulous items. 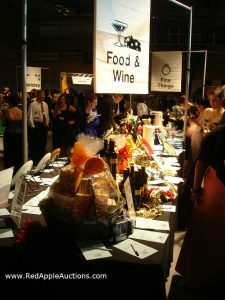 Your silent auction is primarily volunteer-run. This is the easiest way to bring newbies up to speed! Use it every year to educate your team. Preferably watch it as a team, or at least ask each member of your volunteer committee to watch the DVD. Well presented, problems tackled quickly, and I learned a lot of new things! What more could you ask? Benefit auctioneer Sherry Truhlar helps charities across the USA, averaging more than one benefit auction per week. Dozens of other clients are supported annually through consulting, and she’s taught thousands of people through her silent auction webinars on Charity How To and similar platforms. 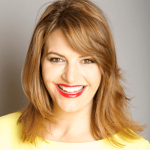 Her marketing prowess is brought to bear on silent auctions, as she teaches auction planners how to incorporate simple and complex strategies into an event in order to realize more revenue. 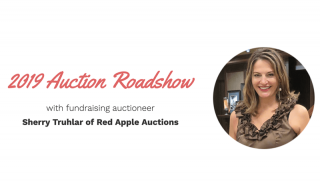 As an expert teacher and national educator on all-things benefit auction oriented, this webinar provides all the tools necessary to lay a solid foundation for setting up and selling your silent auction. Using one of your tips, we increased the silent auction results to 95.36% of value … last year we were less than 70%. Yahoo!!! We also found it easier to manage. Our grade school auction is in its 21st year, and although we raise over $130K each year, we knew we needed guidance to push us to the next level. Sherry gave us countless ideas that aren’t going to cost us a penny, but will ensure that we are getting the most out of every auction item and every donor (while also making our valued donors feel that they got a great “deal”). Sherry believes in putting the fun back into the silent auction.Just because it’s called a silent auction, doesn’t mean it is quiet! The biggest benefit: My team saw my enthusiasm and now they are even more committed to making ours a premiere event. Thank you. Vel Hux of WCCS, Inc.
Sherry presented many creative and cool ideas to increase bidding in silent auctions. I loved her philosophy that a silent auction is much like a “store” and that you have to make it visually appealing and attractive. She gave the group great ideas to make their events shine and to expand the audience base. I loved it! Several years ago, I took a workshop from auctioneer Sherry Truhlar. I thought I knew a lot about auctions when that workshop started, but Sherry’s presentation was truly an eye opener. Many of the positive changes that resulted in big growth in our auction have roots there. Sherry was an engaging presenter from the moment she took the stage and I learned so much from her that day and in the advanced training webinars we bought that year and since. The honed growth our silent and live auctions have enjoyed over the past three years is directly linked to what our committee has learned from Sherry along the way and the resources she has provided for companies we didn’t have access to before. Those resources have resulted in airfare, Disney tickets, a Coach bag, and all manner of great items for packages that have built our auction. Sherry has been there, seen that, and more than has the t-shirt. Heck, she printed the t-shirt. Not only does she know her stuff, she is able to make the entire time entertaining for all. Sherry has a wealth of information about benefit auctions. Her unique perspective from the standpoint of an auctioneer allows her to share what works in reality and not just on paper. Her energy and enthusiasm are extremely contagious.